Just weeks after a Bill to outlaw the use of wild animals in US circuses was introduced to Congress (Traveling Exotic Animal Protection Act – H.R. 4525), ADI has released film of elephants used for children’s rides fighting as workers try to control them with bullhooks, metal bars and stun guns. This latest video adds to the growing body of evidence on the danger of these cruel and outdated shows, where large and potentially dangerous animals are kept in collapsible, mobile and temporary facilities, in close proximity to the public. One of the rampaging elephants featured in the video, Isa (owned by Carson & Barnes), has been reported to have escaped on more than one occasion. In late March, three circus elephants escaped from Moolah Shrine Circus in St. Charles, Missouri. A number of cars were damaged but fortunately no one was hurt. Several people have been killed and injured by aggravated elephants in the US in the last few years. 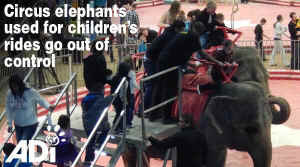 The previously unreleased footage shows circus workers frantically trying to control the elephants as they run amok inside the UCCU Events Center at UVU Orem, Utah. Trainer Habib Omar and another elephant groom lash out at the elephants with bullhooks as they desperately try to contain them. Isa the elephant initially ignores the groom’s blows and charges into another elephant, believed to be called Bunny, easily driving the other elephant, weighing more than two tons, backwards. Despite this violent incident and the recent rampage in Missouri, the circus continues to give rides to children on these elephants. Other ADI footage released of the elephants performing in Utah, New Mexico, Texas and Oklahoma, shows that the animals are controlled with blows and jabs from an instrument known as a bullhook – a heavy bar with a metal hook on the end – as well as receiving electric shocks from a stun gun. Presenter Habib Omar can be seen to slip a stun gun from his pocket during performances and then give the elephants an electric shock. H.R. 4525, The Traveling Exotic Animal Protection Act, introduced by Rep. Jim Moran (D-VA), would reform the circus industry by eliminating wild animal acts from touring shows while allowing human performances and domesticated animals like horses and dogs to continue. With just a few minutes of the average 2-hour show featuring wild animals, it is a simple matter for the circuses to re-tool and re-shape their shows.